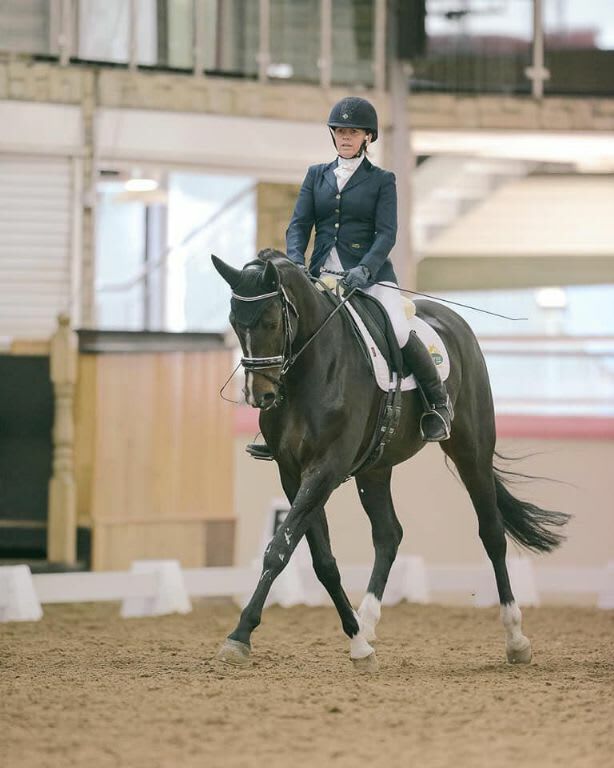 As we continue the Bluegrass Horse Feeds "Behind the Success" series we caught up with Bluegrass Horse Feeds customer and Para Dressage Rider Angela Lyons from Co.Cork. Angela has competed and won 11 national titles and in 2018 represented Ireland at Bishop Burton CPEDI 3 Star where Team Ireland took home Bronze. My old horse Latino J was a great partner. We went all the way from just broken to Prix St George level. He is now actively retired at 27yrs. My current horse Woodcroft Santa Cruz (aka Tommy) is super talented but has reminded me that horses have their own mind! It would have to be Valergro. 3) If you weren’t a Dressage rider, what would you like to be? If I didn’t do Dressage, I’m not sure what I would do probably something with art. My favourite Dressage show in Ireland would be the National Championships in Cavan. Bishop Burton CPEDI in the UK was my favourite show of 2018. My first International in a long time. It would have to be The Greatest Showman due to the Dressage diva in me but anything with Hugh Jackman is very acceptable! Visualise my test so I don’t forget where to go. A Paralympic medal would be a dream to win or a Freestyle to Music Class at the National Championships.I love riding our musical routines. I use lots of Bluegrass Horse Feed products.Tommy is on Bluegrass Re-leve and I use the Cool and Condition cubes to give him a great topline.The older horse 27yrs, is on Turmash and Re-Solve cubes which keeps great condition on him. I started riding at 6 on a donkey called Sally.We never moved very far! I upgraded from my donkey to my sisters Shetland pony Beauty. As is usual with Shetlands I spent a lot of time on the ground, but she did improve my seat and determination! With my old horse I won 11 National titles but my proudest moment to date is being selected to ride for Team Ireland Para Equestrian at Bishop Burton last summer and placing in the top 5 in every class. My favourite training exercises must be transitions either within the pace or from pace to pace. My advice to younger riders is in horses’ things are rarely perfect. Things go wrong, we fall but get up brush yourself off, take a deep breath and try again.Give yourself a push and you never know what you could achieve.